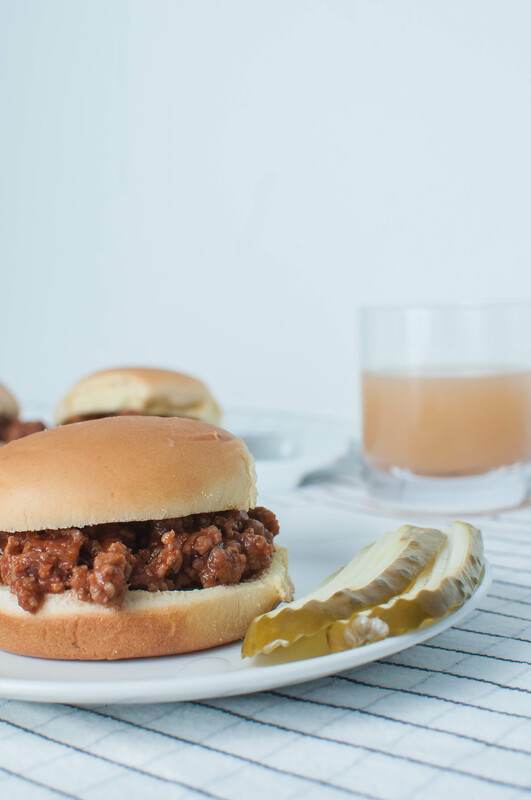 These Sloppy Joes put a fun spin on a childhood classic and make weeknight dinner a total breeze. *Edit: this post was originally shared all the way back in 2011. I have updated the text and photographs to reflect my updated style and voice. Do any of you have one of those meals, dishes or foods that you claimed to hate as a kid and love now? Sloppy Joes are one of those foods for me. Sorry mom. If it makes you feel better, karma is hitting me hard. If you guys have followed me for some time, you know I a picky child who doesn’t like any kind of meat unless it comes in the processed, nitrate-filled form. Oh the joys of parenthood. I’ve found that he’s more likely to eat ground meats though and when put between a bun I have even better odds. Because bread. So Sloppy Joes have obviously become a staple at our house not just for the fact that nobody complains (although it’s a HUGE selling point I tell ya) but because they are simple and delicious. This version of Sloppy Joes uses some unusual ingredients to make them a little different and way tastier. Barbecue sauce is one of the secret ingredients and it lends a sweet, smoky flavor that a normal Sloppy Joe doesn’t usually include. I also sub in pickle juice for the usual vinegar in a sloppy joe to add a delicious tang. Also because pickles make all sandwiches better. It’s a fact. Another major selling point is that they will be done in less than 30 minutes. I have also made them earlier in the day and put them in the slow cooker on warm so that all we have to do is slap them in a hamburger bun and we’re ready to eat. That’s also a great option if you have kids in activities at different times throughout the evening. I reach for this recipe on nights that I forgot to thaw something from the freezer or just plain forgot to plan something for dinner. For me, the ingredients are all pantry/fridge/freezer staples so I almost always have what I need on hand and I bet you will too. Heat a large skillet over medium heat. Add ground beef and onions, cooking until beef is no longer pink and onions are softened. Drain off any excess grease. Add remaining ingredients and lower heat. Simmer for 20 minutes.